Welcome to another installment of our “Back Home Proud” series, a re-occurring feature in which Apps and Ex-Apps tell us, in their own words, what their Appalachian identity means to them. Today we hear from Sam Shinault, a photographer, guitarist and mandolin player for the Two Dollar Bill Band, an old-time, bluegrass and newgrass band in the Hampton Roads area of Virginia. I grew up in the heart of the Appalachian Mountains, my first 18 years in the small town of Wytheville, Va., which is about half way between Roanoke and Bristol. It was there the seed of love for the mountains was planted, but it took some time, some growing up and immersion in the region’s music for it to grow into something I’m proud of today. After high school I enrolled at Radford University just 45 miles down the road from home. It was eye-opening meeting new people from places I had never heard of or visited. Most people living in my dormitory, and the people I befriended, were from either Richmond or the Hampton Roads area. A lot of people thought I was from the Virginia Beach area because of my association with the beach kids. I was fine with that. No one wants to be seen as a ‘townie’ at school. Being a local was by far the least cool place to be from at Radford. It wasn’t until I was in my last year of college that my love for mountain music began to sprout. That’s when I first began camping and participating in jam circles at the Old Fiddler’s Convention in Galax, Va. I enjoyed mountain music even as a teenager but wasn’t a regular listener. But, that changed soon after those first three days at the convention. It wasn’t just music I was in love with, it was the people too. The convention is for amateur bluegrass and old-time musicians to gather and compete against each other in different instrument categories (fiddle, banjo, mandolin, guitar, etc). The real sights to see and hear though are not on the main stage, but in the jam circles that go until the wee hours of every morning. I had been playing guitar for about 12 years. I still didn’t feel skilled enough to sit in with the folks jamming at the campsites. I did however want to learn and become a good enough picker to sit in with the big guns. At the end of that summer I moved to Norfolk, Va., to attend Old Dominion University. While studying political science, I continued to delve deeper into bluegrass music. I would sit and listen to the few bluegrass cds I had and play along with them by myself in my apartment. I practiced for an entire year like that since I didn’t know other musicians in the area who were into the genre. Then August and the Fiddler’s Convention came around again. I spent most of that week with folks I had met the year before learning as much as I could; playing every night until my fingers were too sore to play anymore. 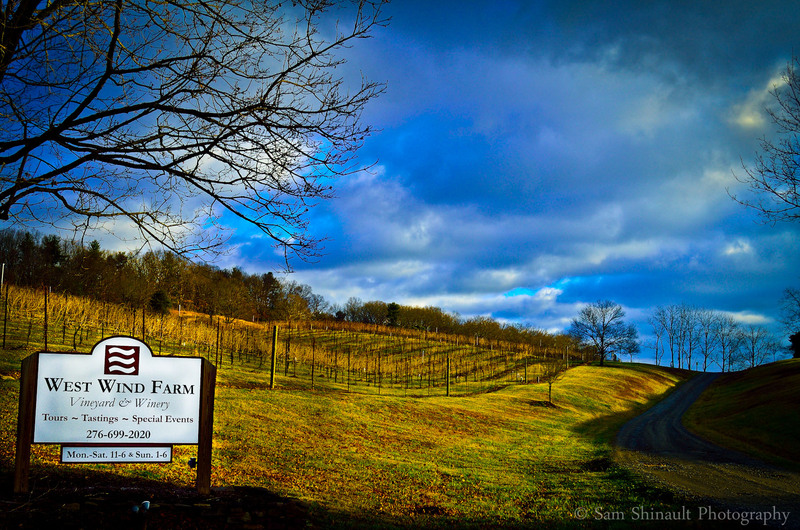 West Wind Farm in Max Meadows, Va. Photo by Sam Shinault. It was that year that I picked up a mandolin for the first time. It was love at first chop. One of the guys at our campsite taught me three chords and after that there was no looking back. As soon as I got back to Norfolk and saved up enough money I bought my first mandolin. I did the same thing I did with my guitar the year before. After my 3rd year at the Fiddler’s Convention I felt ready to seek others in the Norfolk area to pick with. After attending some local shows and with the help of a friend I met some really talented musicians who loved bluegrass and old-time just as much as I do. We all met up, had a short jam session and managed to get through a handful of pretty standard bluegrass tunes. We took that handful of songs to the streets of downtown Norfolk that afternoon and received a great response. It was such a great feeling to know that those of us playing weren’t the only ones who appreciated mountain music. I think it was around that time I truly began to be proud to be from the Blue Ridge Mountains where a lot of the music originated. Needless to say, I was much obliged when the Two Dollar Bill Band was nominated by Veer, a local magazine, for ‘Best Americana’ group in Hampton Roads. When first starting to play with the band it was just something fun to do on weekends. Then once we started playing regularly it became more important to me to serve as an ambassador of the music from home. Bluegrass and old-time is the music of my heritage. My family has been residing in Virginia since the late 1600s. My roots in and love for mountain life and music runs deeper than the coal mines my granddaddy made his living in. Since moving to Norfolk I have also picked up the shutter bug. Every chance I get to go back home I spend the majority of the time exploring the countryside and capturing its beauty on camera. It serves as another way for me to share the splendor of the Appalachians with the rest of the world. I’m now working toward becoming a full time photographer. The landscape is not the only beautiful thing about the mountains. The real beauty is in the people. They are by far some of the most hospitable, kind-hearted and honest folk you’ll find on this green earth. It’s for these reasons, I am and will forever be, ‘Back Home Proud’! Click here to see a live session with Two Dollar Bill Band and here to connect with them on Facebook. Sam Shinault is a photographer, guitarist and mandolin player for the Two Dollar Bill Band. Find his photography at www.SamShinaultPhotography.com and on Facebook.